Economic forecasters expect the budget cuts of the sequester and other looming political battles to hold back GDP growth to 2.4 per cent in 2013, according to a survey published Monday by the National Association for Business Economics.And about 60 per cent of the panelists said they expected the sequester’s cuts to occur, either partially or in full, as they are set to begin kicking in this week. A whopping 95 per cent of the 49 economic forecasters who participated in the NABE survey said they expected that GDP growth would be negatively affected by the “uncertainty” to come with fights over the sequester, continuing resolution, and the debt ceiling. The economists expect GDP to grow 2.4 per cent in 2013, followed by a 3 per cent uptick in 2014. About one-third of those surveyed think that GDP growth will decline a half a percentage point or more as a result of the U.S.’s “fiscal imbalances” — the fights over sequestration, the debt ceiling and the continuing resolution. Panelists forecast that the federal deficit will shrink to about $900 billion in fiscal 2013 (October 2012-September 2013) and about $761 billion in fiscal 2014. On a more positive note, the panelists said they expected the U.S. unemployment rate to drop to 7.2 per cent by the end of 2014. The survey comes as President Barack Obama and Republicans in Congress battle over whether and how to avert the cuts of the sequester. The White House warned Sunday of the state-by-state effects of the sequester, blaming Republicans for not working to find a solution. 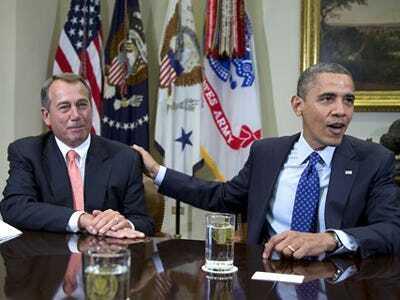 House Speaker John Boehner, meanwhile, is holding a press conference later today.